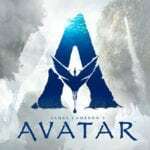 Starring Jacob Tremblay, Julia Roberts, Owen Wilson, Izabel Vidovic, Noah Jupe, Danielle Rose Russell, Nadji Jeter, Millie Davis, Sonia Braga, Emma Tremblay, Ali Liebert, Daveed Diggs, Crystal Lowe, and Mandy Patinkin. Ten year old Auggie Pulman was born with a genetic condition leaving him with extensive facial scarring. Previously home schooled by his mother, it’s time for him to join the other children in fifth grade. It’s a challenge for him, for his parents and for everybody else in the school. Remember Rocky Dennis? He was the teenager with a skull deformity at the centre of Mask (1985) whose mother was determined he should lead as full a life as possible. Fast forward to now and a pre-pubescent version, August Pulman, known to everybody as Auggie (Jacob Tremblay). Like his cinematic predecessor, he looks different, but this time because of a genetic condition: it’s never given a name in Wonder, but it’s Treacher Collins syndrome, which affects his ears, eyes and, in Auggie’s case, means he’s gone through a number of operations in his young life which have left him with facial scarring. He’s spent his first ten years at home, with his protective mother Isabel (Julia Roberts) putting her own career on hold to look after his schooling. But she’s decided it’s time he joined in with the other children at the local mainstream school. 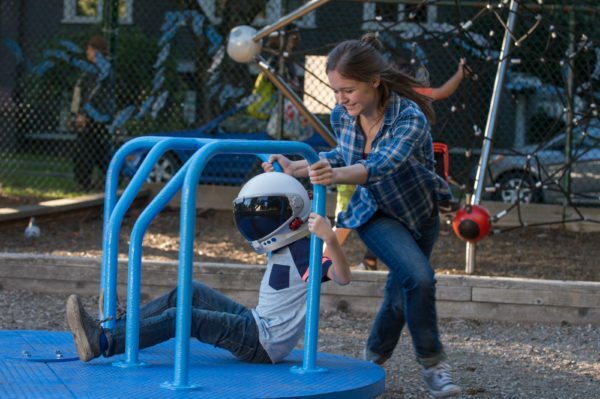 He’s reluctant, turning up on the first day wearing his space helmet so that nobody can see his face. The whole experience is a struggle for him: not just the first day, but the subsequent weeks and months. Making friends is hard, despite the support of the teachers, because he’s so obviously different and bullying is a sad inevitability. But the film isn’t just about him: it’s about his parents, his older sister and the friends he eventually makes. All of which sets us up for something that confronts the reality of living with disability, for the person concerned and everybody around them. But that’s not quite what we get here. On the surface, it’s more akin in tone to The Waltons and the mother appears to be a latter-day Momma Gump. She may not come out with that fatuous – and factually inaccurate – line about the box of chocolates, but the film veers perilously close with “you can’t blend in when you were born to stand out.” It’s predictable too. Auggie is very bright: admittedly not a genius, but way ahead of his class when it comes to science, which is his big passion. So it’s no surprise when he and the thoroughly nice Jack (Suburbicon’s Noah Jupe) win first prize for their science project. Which makes it all a bit sugary. And yet ….. and yet ….. There’s a sincerity about the film that positions it on the right side of sentimental goo. Sugary, yes, but thankfully not syrupy. Mostly. 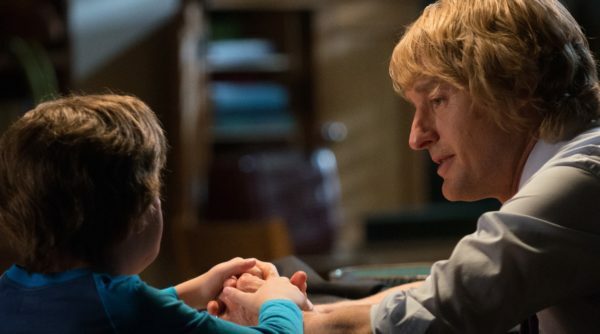 Part of that is down to the performances, especially young Jacob Tremblay who, while not stretched in the same way as in Room, establishes Auggie as a regular kid who likes Star Wars and has the intelligence to help him through those difficult situations. The real find, however, is Izabela Vidovic as his older sister, Via. Initially, she comes across as too good to be true, happily allowing her parents to concentrate on her brother. But when the time comes for her individual chapter – everybody has one – we watch her cope convincingly with the problems of being a teenager almost completely on her own. That she doesn’t go off the rails is astonishing. 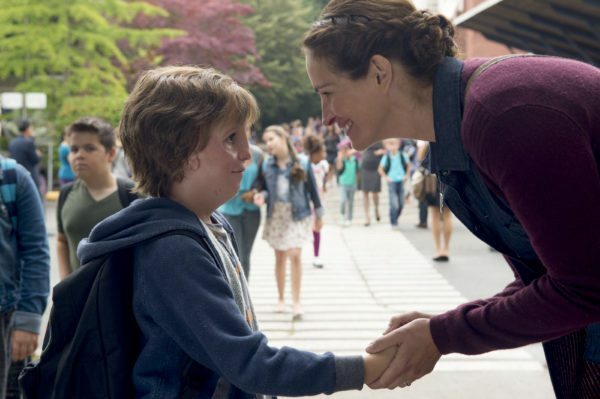 But, as the end of Auggie’s momentous first year at school approaches, director Stephen Chbosky throws caution and restraint to the wind and aims straight for the tear ducts. The sugar melts into syrup, it’s spread thickly and there’s a strong sense of emotional manipulation, something that’s been noticeably absent until now. The sad thing is that it didn’t need to resort to this: the story is moving enough as it stands, yet the climax in the auditorium turns into one family sized cliche. 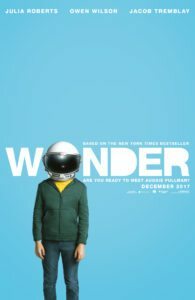 With its messages of kindness, tolerance and compassion, Wonder should have been a feel-good movie, pure and simple. But ultimately it gives in to the temptation of schmaltz to the extent that you won’t only need tissues. A brown paper bag might come in handy.